3. Bedding- Bedding is an important consideration for your hamster. Cedar bedding is not a good choice because of the oils in this wood, and many vets recommend recycled paper material which is soft and very absorbent. 4. 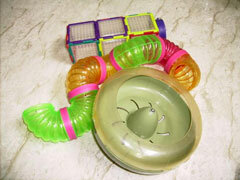 Food Dish- A food dish is one of the essential hamster cage accessories. You could place the food on the floor of the cage, but it will get contaminated with hamster droppings and other materials. A dish will prevent this. 5. Water Bottle- Even cheap hamster cages will require a water bottle, so that your pet can drink and stay hydrated. 6. Bubble- A bubble can be a fun accessory, one that you and your hamster will enjoy. This component is simply half of a clear plastic ball, and your pet can use it as a window or to sleep in. 7. Hide A Way House- One of the top ten hamster cage accessories is a Hide A Way house, and these can be found in different styles and sizes, There are even castle versions, and this will give your hamster some privacy and a place to get away to. 8. Chew Blocks- Whether you are looking for Syrian or dwarf hamster cages chew blocks can be a great accessory. These blocks offer your pet something to chew on, and this is an activity that they love. These blocks also keep their teeth in good condition. 9. Treat Sticks- Treat sticks are popular hamster cage accessories, and these sticks can attach right to the side of the cage. Fruits, nuts, vegetables, and even peanut butter and seeds can be offered in this way. 10. Mineral And Salt Blocks- Keeping hamsters as pets means making sure your pet has all the proper nutrients. Mineral and salt blocks can help your pet stay healthy, and are a great addition to any cage.